Jardic Pro dictionary. Update. 35,000 articles. Unicode Han Database from Unicode Consortium UNIHAN. Original Unihan text file was converted to DSL file by LiBeiFeng. Large Chinese-Russian Dictionary BKRS. 2,918,000 articles. Source: "大БКРС" dictionary. Compiled by: http://bkrs.info. Japanese-Russian Medical Dictionary. MEDIC. 86,000 articles. Compiled by Vassily Loboda. Works by Anton Chekhov translated by Jinzai Kiyoshi. The file contains parallel Japanese-Russian texts of 24 stories and plays including: "Uncle Vanya", "The Cherry Orchard", "The Seagull", "Kashtanka", "The Lady with the Dog", and others. Japanese Law book file that contains The Constitution of Japan, Civil Code, Copyright Act and Companies Act. Parallel text of The Constitution of Japan is in Japanese, English and Russian languages. Texts of other laws are in Japanese and English. "Stories" book file with literature works from Masao Utiyama's collection of alligned translations. The file contains more then 20 aligned translations of works by Akutagawa Ryunosuke, Arthur Conan Doyle, Ambrose Bierce, Aesop and other authors. "Stories1" book file with literature works from Masao Utiyama's collection of alligned translations. The file contains more then 20 aligned translations of works by Charles Dickens, Charles Perrault, Edgar Allan Poe, Scott Fitzgerald and other authors. Jardic Pro can import external dictionaries in EDICT, KANJIDIC, ENAMDIC, EIJIRO (TXT), DSL ABBYY Lingvo formats. Some DSL dictionary files can be downloaded from the page of Lingvo Association of Lexicographers. Eijiro dictionary files in TXT format can be bought at Eijiro Web site. 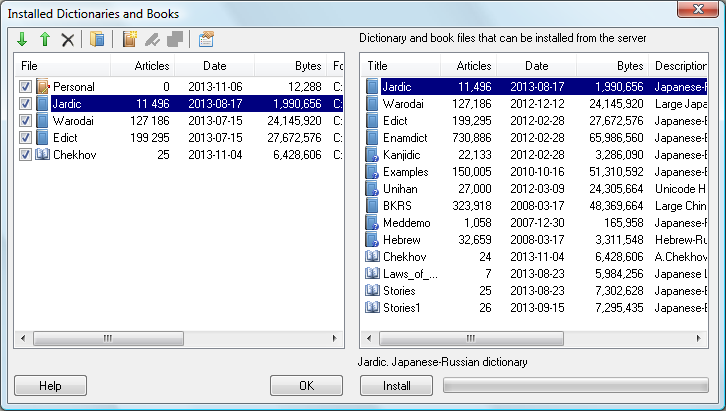 After you installed Jardic Lite you can download additional dictionaries listed below. Click "Run" for the question "Do you want to run or save this file?" Select dictionary file and click "Open"
Japanese-Russian Medical Dictionary. Demo version. Dictionaries can be used to run flashcards with words for each Lesson.